Ralph Lauren Automotive Skeleton watch. 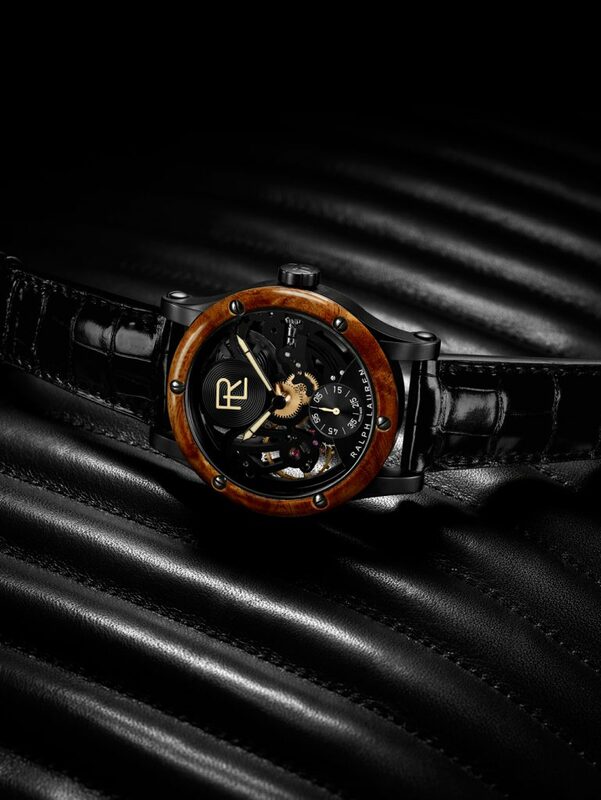 An avid collector of incredible vintage automobiles, Ralph Lauren was once quoted as saying, “Cars are like art – moving art – an accomplishment in mechanics and precision.” In a similar feat of accomplishment in mechanics and precision, Ralph Lauren recently introduced the brand’s first open-worked timepiece, the RL Automotive Skeleton, to its coveted RL Automotive collection. This bold and masculine timepiece draws its inspiration from Ralph Lauren’s own 1938 Bugatti Type 57SC Atlantic Coupe. 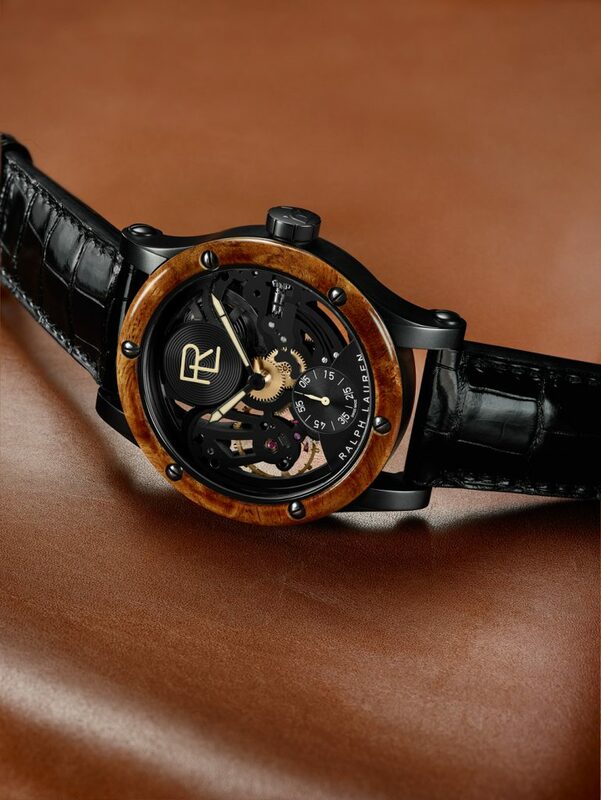 In a nod to the rich interiors of the automobile, the watch features luxury materials including hand cut hardwood and signature alligator skin. The Ralph Lauren Automotive Skeleton watch is the brand’s first fully open-worked piece. 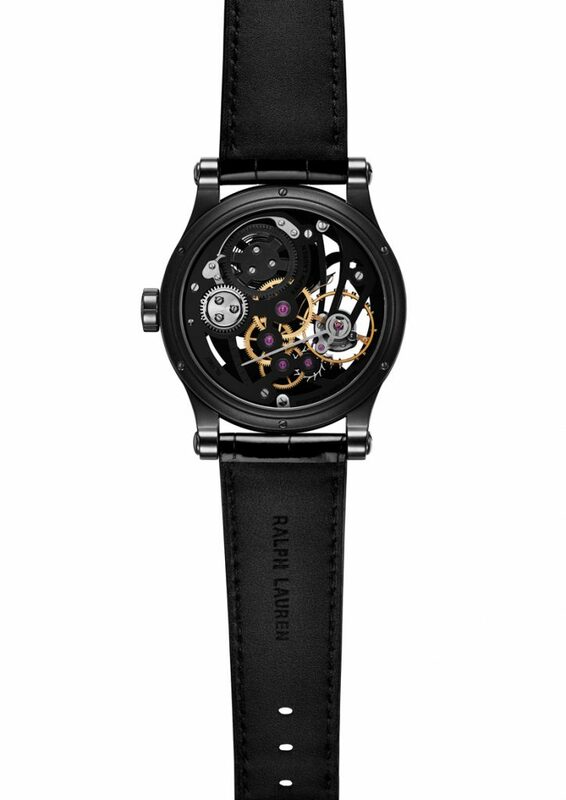 Crafted in a black gunmetal steel case, the RL Automatic Skeleton is dark, bold and sturdy. As a completely open-worked timepiece, the bridges of the movement have been blackened in color to reflect the dark masculine aesthetic of the watch, and the main plate of the timepiece has been artfully cut way to reveal the intricate mechanics underneath. At 12 o’clock, a galvanized, matte black, azure sub-dial features the Ralph Lauren logo, while at six o’clock a seconds sub-dial features white Arabic numerals and an azurage pattern. Black oxidized sword-shaped hands with beige Super-LumiNova complete the rich look of the watch. And it is a rich, luxurious skeletonized timepiece. The satin-finished case is large in size, measuring 44.8mm in diameter. The strong, refined, bombe’-shaped bezel is crafted out of amboyna burl, a hardwood that is hand-cut by an expert to reveal the intricate patterns and depth within its twisted grain. 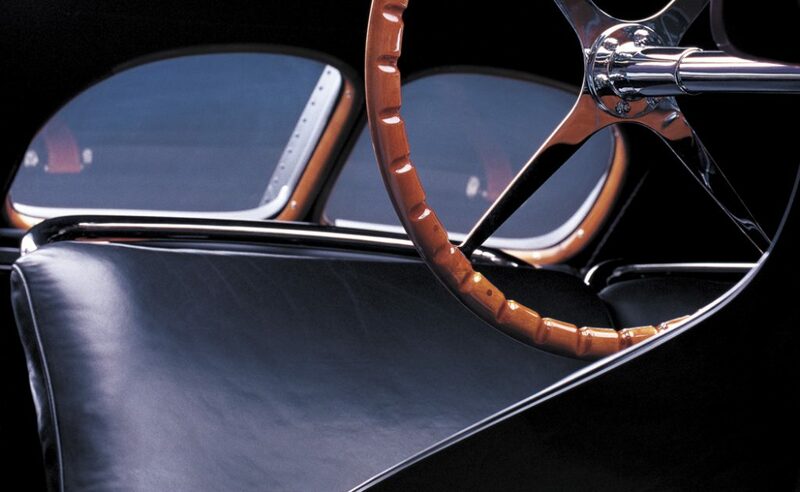 This is a nod to the fine wood steering wheel of the Coupe. The RL Automatic Skeleton sits upon a shiny black alligator strap, which offers a striking complement to the matte finish seen within the rest of the watch design. The movement inside the Ralph Lauren Automotive Skeleton watch was made by IWC for Ralph Lauren. Just as one understands that an automobile is nothing without a good engine, nor is a watch without an exceptional movement. The RL Automatic Skeleton is powered by an IWC hand-wound, mechanical movement specifically customized for Ralph Lauren. The RL 1967 movement runs at a frequency of 18,000 vibrations per hour, and has a power reserve of 45 hours. This seems adequate, though 72 would have been better. 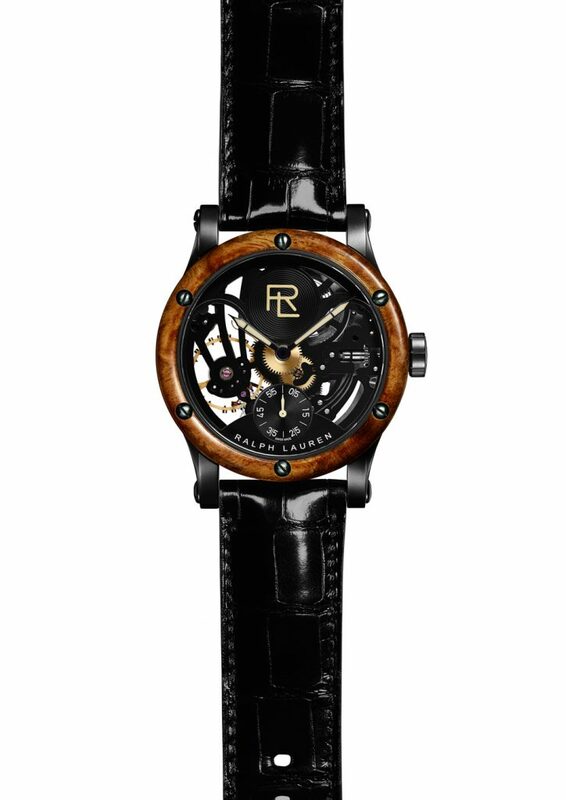 The RL 1967 movement housed in the Ralph Lauren Automotive Skeletong watch has 156 components. The RL Automatic Skeleton made its first appearance during Ralph Lauren’s 2017 fall fashion show, set against the spectacular backdrop of Mr. Lauren’s esteemed automotive collection in his own garage where the famed Bugatti was also on display. This was also a first for Ralph Lauren — to hold the show in his garage. The watch retails for $50,000.